Just a something I felt like talking about on a lark, with my camera settings on "Weird Color" for the fun of it. The discussion has to do with how I use my Elkron Alignment Correspondence system and how it works basically. Impromptu, and a bit scattered, perhaps, but nevertheless does have the basic idea layed out. I hope it will suffice to give people an idea of one of the background concepts behind the Elthos Project, and what the potential value of the Elthos Tarot Deck might be. I have left the Elkron and their workings deliberately vague because I don't want to create too much Setting for the Mythos Machine. The point of the project is to encourage other people to use their own creativity. So the Elkron are there as a framework, more than as individual beings with histories. How GMs handle them in the future is something I shall be very curious to see. That said, there are some rules to them. I will try to give them to you in the order of importance I think they deserve (you may wind up disagreeing, and that's ok). 1. Each Elkron is the Embodiment / Avatar / Reflection of one of the 12 Alignments. 2. There is a table of correspondences for the Elkron, and it lists each Elkron's corresponding symbols ... plants, trees, animals, colors, gems, flowers, musical notes, and so on. These are used by the GM to build symbolic references in their World that only the Sages are likely to notice or understand. 3. The Elkron are divided into two major groups... the Celestials who are in the Heavens (Constellations and Planets), and those that dwell in the Realm of the Id (the Jungian Archetypes of the Tarot). Each Elkron has both aspects, so there is an upper-world and an lower-world aspect to each Elkron. In addition both groups, the Celeistials and the Archetypes, have an inner circle of 12 members, and an equal number of outer circle members. These correspond with the Titans and the Olympians... the Old Gods and the Young Gods. The Constellations and the Archetypes that correspond to them are the Outer Circle or Elder Elkron. The rest are the Inner Circle or Young Elkron. 4. Each Elkron has a Throne. Their interplay is the original Game of Thrones. 5. There is a game that the Elkron Play. I have some rules for it but haven't play tested it yet. We can skip lightly over this for now, but I want to explain what the game is like. There are Ages. Starting with the Dawn Age where the Elkron Incarnate and create the World. The start with a certain amount of Kismet and use that to fashion the world to suit their plans. Different alliances can occur, depending on circumstance. After the Dawn Age comes another wherein the Elkron create the Races of the World. The Good Elkron will create Good Races, etc. They also plant the Seeds of Destiny, which are Holy Quests. Another Age is called the Age of Heroes. This is where the Elkron step back and watch how things transpire. By this point the Elkron have spent most of their Kismet on building the World and creating the Seeds of Destiny. The Heroes are there to fulfill the Quests. Whenever a Quest is fulfilled the Elkron who created it gains Kismet, according to a multiple of how much they spent to create it, which relates to how complicated or difficult it is. So the Elkron gamble during the Dawn Age that their Heroes will fulfill their Quests and allow them to regain their Kismit. Because they are going to need it. The final Age is called The End of Ages, and it is the War of the Elkron that will be the calamity of the Universe, and end the World. The Elkron who have regained their Kismet fight it out to determine which of them will be the Ruler of the next Universe. The Ruler of the Elkron's alignment is what stamps the Universe with it's initial Kismet, and sets everything in motion (setting the base Alignment of that Universe). Anyway, I don't expect to get around to this game soon, but the idea is that a group of Elthos GMs get together for a month or so before they create a Shared World. They each play one to three Elkron, and set up the Races, and spend Kismet, and create Seeds of Destiny. When the Dawn Ages are completed and the Races created and all the terrain is built, then it's time for the Age of Heroes to begin. The GMs then invite their Players to Gen Characters and those are the Heroes who will try to fight it out. The purpose of this is to help the GMs create a back story that makes sense, and is also part of a game the GMs themselves are playing with each other. I see this is a phase III thing. But I also thought it would help you to understand the Elkron a little better to hear about it. As for how to create the Elkron... it's up to you for your world. Just allow that each Elkron represents and Alignment, and those Alignments associate to certain Philosophies. [N] – : "There are many Elkron of Power, Cunning and Wisdom." [C] – : "There is no Elkron; every one is for themselves." [C-G] – : "There are Chaotic Good Elkron; the ultimate attainment is to be free." [C-G-N] – : "There are only Good Elkron; man’s purpose is to create art and live free." [G-C] – : "There are Elkron, but men must rule their own affairs by reason." [G] – : "There is one Almighty Elkron, the King of the Universe; Seek Love." [G-L] – : "There are Elkron; man is to work for the Good and obey the King." [G-L-N] – : "There are Elkron; man’s place is to be serious, able and Just." [L-G] – : "There are Elkron; man’s place is to obey the Laws of the Empire." [L] – : "There is no Elkron, only laws of nature; mans place is to learn them." [L-E] – : "There is Hades; man’s place is to obey the Emperor and die." [L-E-N] – : "There are evil Elkron; man’s place is to obey the Emperor no matter what." [E-L] – : "There are evil Elkron; man is to obey the cruel and suffer." [E] – : "There are only Evil Elkron; man’s place is to serve and die." [E-C] – : "There are no Elkron; man’s place is to serve the Community and fear." [C-E-N] – : "There are no Elkron; man’s place is to overthrow the Elite." [C-E] – : "There is no Elkron; every moment should be lived for pleasure." Also note - the Elkron live on the Celestial Island of Elthos (in my World), and the there are 24 Thrones ... there is an inner circle of mountains called the Dragon's Teeth, and an outer cirlce called the Dragon's Spine. On 24 of these mountains in ancient temples along inaccessible ridges are the 24 Thrones upon which the Elkron sit. From these Thrones they converse with one another, and observe the lands of their child races, and their heroes, below. The connecting thread between all Worlds is the Alignment system. Through that permeate the manifestations of the Elkron in their myriads of Universes. The only thing that doesn't change is that there is Good and Evil, Law and Chaos at the root of all things. That is the foundation and metaphysical constant of the Elthos Multiverse. 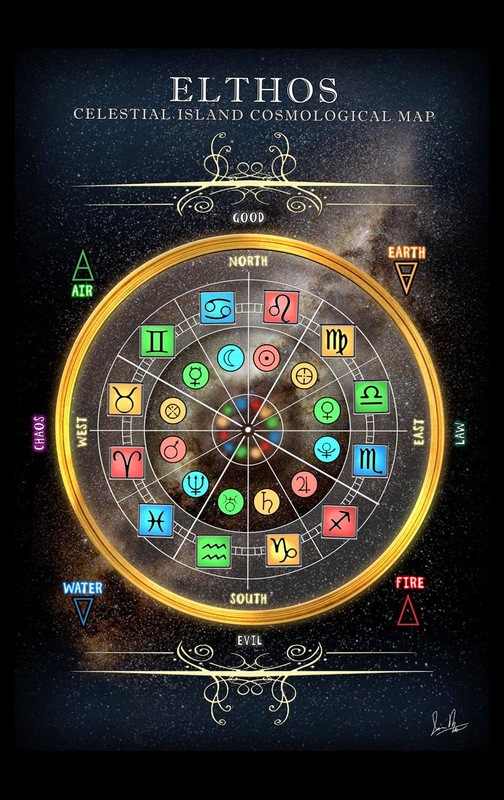 Also note that at the top of the post you can see the Elthos Tarot backface of the cards which shows the Celestial Island Map... that shows which Elkron are where, what their Associations with each other are by position, element (air, earth, water, and fire), and their Alignment positions. That has served me quite well over the years. And once when I got lost in an interdimensional time-rift by accident, the card was useful in helping me to navigate back to earth in the 21st Century. So keep a card with you... never know when you might need it. Anyway, the way the Alignments work in the game itself is that as Characters do things they get evaluated by both their Action and their Motive. Between these two the Action determines the Law-Chaos value (an integer between -6 and 6), and the Motive determines the Good-Evil value (an integer between -6 and 6). So as Characters do things in the World for different reasons their Alignment changes accordingly. As GM I usually consult with the Players to find out what their Characters Motives were for given actions if it wasn't obvious, but Actions are a bit more deterministic. The Mythos Machine interface provides a way to note Alignment changes in the Experience Gains Screen. The result is that 1) Character Alignment is not fixed - it changes according to what the Players do with their Characters, and 2) Character Alignment changes can be tracked and shown over time - which is very cool, though not a feature that is implemented visibly in the Mythos Machine as such, yet. It will be... but only after other more pending development is finished up. At some point I will publish more about the Elkron once the project's Phase I is complete (pretty soon now), but for now, for Gamemasters using the Mythos Machine at this stage of the Elthos Project Development, this is probably good enough to get you going. Elthos Tarot Deck ... coming soon to a POD service near you. Cheers, and have fun with it. That’s a continuous challenge, isn’t it? I have a couple of thoughts. First you need to figure out why people aren’t showing up. Is it just random life-stuff among busy people? Or could it be your game is just not drawing them in, and they’re too nice to say so? If the latter then you need to up your GM Level and start providing a better game. And that, of course, can be a challenge when you’re not sure what you’re doing that could be improved. And often players themselves don’t know the answer to that either. So, as a rule of them, keep games tight, action oriented, and don’t let the players get bogged down in tiresome conversations about “what should we do”… always be ready to throw them into the action again, and keep things exciting for the players. Even a TPK is better than an evening spent debating about Door #1, Door #2, or Door #3. One of the problems I’ve had along the way was a rule I concocted years ago that I thought seemed reasonable, but turned out to be not-so-great. If a player didn’t show, then my rule was that their character would go kind of inert. They’d be there, they’d fight if necessary, but they would not initiate actions, or offer useful advice, or demand their due, or make crazy things happen, even if their player would. This was because I felt that if I did so as GM I might play their character “wrong” (ie, they’d conclude that they’d never have played it that way), and if the character died in the process they’d be upset. So the safe bet was to follow my rule. So, I have a new rule, and it’s much cooler. If you don’t make the game then I play your character the way I think he or she Should be played. Mwahaah! All the zest and creativity I can put into it, I will do! I will put a minor shield of protection around the character, but not enough to save them from the Fate of the Fumble, nor will I have them hold back on what’s on their mind. Sometimes they even turn out to be more awesome than ever because some players themselves hold back for various reasons (fear of losing them being the most common). However the player usually plays the Character - I’ll play it that way to the hilt. The games are much more fun that way, and I can actually use the non-player-present characters to spice things up and add an element of “OMG!” to the game that might not even be there if they did show up. So if you don’t show, you take the risk your character will do something kinda crazy, and maybe even get killed. So… it’s a good idea to show up. And lots more fun for everyone when you do. :) That’s my new style. It’s much better this way, believe me.